Mathematics is an integral part of the lives of every one of us. Try as we might to evade it, we will never really be able to escape having to add, subtract, multiple and divide. It is said that the average human performs a mathematical function in his mind a few million times in his lifetime. And yet, there are those who dismiss it as not necessarily crucial to our way of existence. We’ve begun to develop a growing dependency on calculators, the primary consequence of which is to dull the mathematical parts of the mind. We decided that we need to resurrect the human love for numbers. 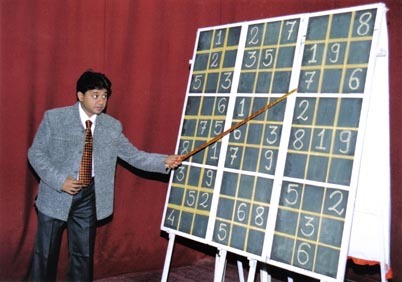 Divesh Shah, on September 7th, 1998, hit the city of Mumbai with his Math Show. What began as a modest attempt to reinvigorate the popularity of math, eventually became the first of his four hundred shows around the globe. This in turn paved the way for him to start the Puzzle Show, another off-shoot of his love for Mathematics. Backed further on by popular demand, he set up the Sudoku Show, designed to break down the complex single digit Sudokus, further building on his base of mathematic enthusiasts. Fast calculations were only one of the many aspects of this romance – he had set his heart on reviving the waning love for numbers. Displaying to mathematical agnostics the magical relationships between numbers and inspiring in them his degree of enthusiasm towards the subject, all gradually led the way for him to eventually set up Math Vision.